I'm undertaking a project to photograph the war graves of all the Lonsdale Battalion Great War dead and put them on my website as a Roll of Honour. The idea is to get a photograph of the grave and a view of the cemetery and lay them out as links in an alphabetical list. I hope to get some pictures of some of the men also via the local paper archives. I am including the men of the Depot Company of which the man below is such. Additional information: Son of Joseph and Matilda Lewis, of 34, Walnut St., Gorton, Manchester. Born at Horwick, Lancs. Welcome to the forum Spike, I hope someone visits this grave for you soon. 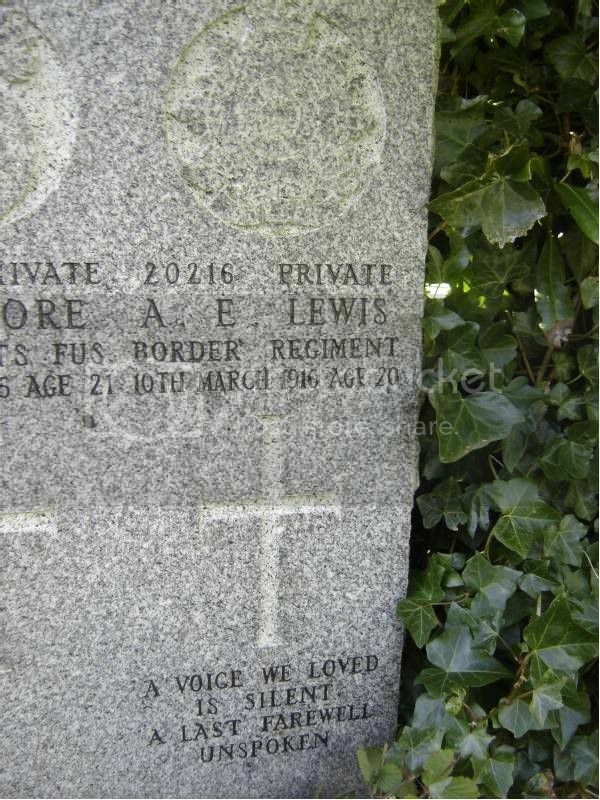 Have you any idea why a Border Regiment man from Lancashire is buried in Greenock? Welcome to this forum. I hope someone in the Greenock area can help you out. Congratulations of your website. Do you know Colin Bardgett? You helped me out with photographs of the memorial at Workington last year which was much appreciated. I'll certainly try to get over to Greenock over the next couple of weeks and get the photos. I don't know what a Lancashire lad in the Border regiment was doing in Greenock, maybe it had something to do with the railways, Adam. Here are the pics Spike, taken on Saturday. Thank you Jim, I really appreciate the trouble you have gone to. I've sent you an email regarding this. Greenock Cemetery I could have for my Roll of Honour ? Just a quick additional note to say I managed into the library in Greenock last week and had a look through the Greenock Gazette for 1916. There is no mention I could find of the deaths of G. Moore or A.E. Lewis. "Heron - At Greenock Infirmary, on the 14th inst. Lance Corporal James Daniel Heron, 1st Seaforth Highlanders - Military funeral from the Infirmary on Monday at 2 o'clock. Friends kindly invited to attend." 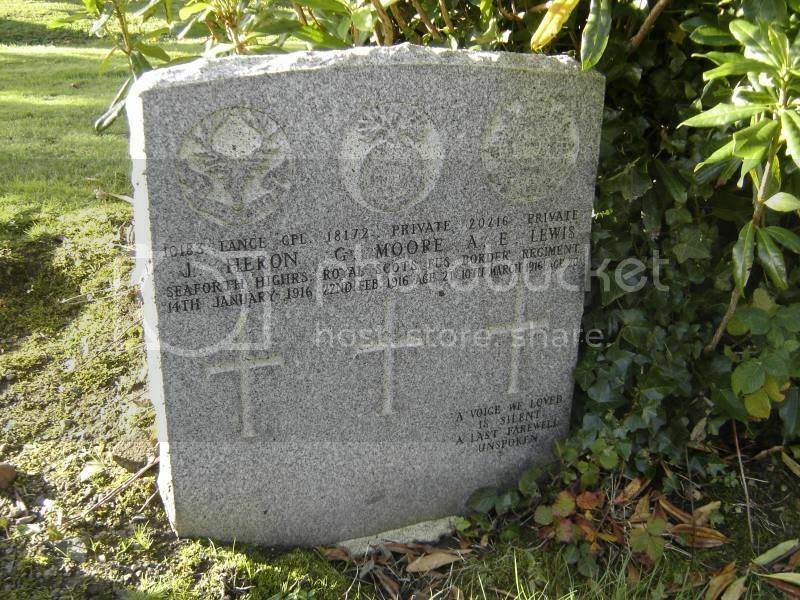 L/Cpl Heron is listed as serving with the Depot, Seaforth Highlanders which was based at Fort George but he died in a hospital in Greenock which was his home town (SNWM confirms he was born in Greenock). I wonder what he died from? The paper lists him as serving with 1st Seaforths. Was it common for seriously wounded men to be transferred from front line battalions to the depot whilst in a hospital bed?